This is a great ride for foodies and lovers of wine, craft beer or art. It includes a detour off the Great Taste Trail up into the beautiful Moutere foothills – the Tuscany of NZ. On this ride, you will have time to explore the historic Moutere area, with it's scenic hop gardens and premier vineyards. There are some hills on the route, so it is best for reasonably fit cyclists or for those riding electric bikes. For one day of this itinerary the cycling is on roads, which are mostly very quiet. 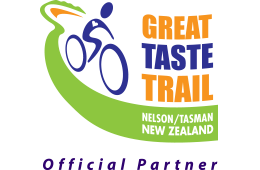 An easy flat ride through the tastiest area of the Great Taste Trail on the Rail Route. As you cycle the route to Wakefield, you will also pass through Brightwater (14 km), and there are lots of places to detour to on the way. This is the wine cycling day, in the densest area of wineries on the whole of the trail. The wineries here are small and generally family-owned and some have cafes. Stop off for lunch or take a side road to explore the lush, flat countryside. The villages of Brightwater and Wakefield are both charming and historic, with their colonial cottages and pretty gardens. Wakefield has an interesting little main street, with some interesting historic commercial buildings as well. The new Spooners Tunnel section of trail could be added to the route today. The new Spooners Tunnel section of trail can be added to the route today. This Spooners Tunnel section of trail is due for completion by early 2019 - please check our news page for more information. More flat riding today, across the Waimea Plains to Rabbit Island. The first section retraces the Rail Route from Wakefield back to Brightwater. From here, there are two route options: one takes (mostly) quiet country roads across the Waimea Plains (28 km). The other retraces the Rail Route back to meet the Coastal Route and on to Rabbit Island (38 km). The on-road route is a favourite of ours, passing a gorgeous historic church and riding some little roads bordered with hedgerows and scenic rural farmland. The Coastal Route follows the edge of the Waimea Estuary, which is industrial for the first 2.5 kms before the urban spread is replaced with reedy estuaries and birds (look out for Spoonbills). The next section is through pine forest before emerging on the beachfront at Rabbit Island. This area is a favourite spot for picnics and swimming. The last section of trail follows the beachfront for approximately 7 km, to the ferry landing and it is just a 10 minute trip across the channel to the Mapua Wharf. The village of Mapua is a popular destination, with galleries, cafes, a craft brewery and little streets that are ideal to explore by bike. Today’s route is on-road, detouring off the Great Taste Trail up into the rolling hills around the village of Upper Moutere and there are lots of little detours which could also be added to your day. A reasonable level of fitness is required as there are some hills. The landscape is rolling with one longer, steady climb of approximately 2 km. The route includes one section of 2 km on a secondary road with no shoulder and is not recommended for the kids. After the climb from the coast up to the summit of the rolling Moutere foothills (elevation approx 100 m) the route is a lovely meander on country roads past vineyards and apple orchards to Upper Moutere. Look out for plantings of grapes, olives, black currants and hops and the old hop kilns, colonial farmhouses and interesting farm buildings. Make time to cycle to Neudorf Vineyards, where you are welcome to take a picnic and relax on the lawn with a glass of their gorgeous chardonnay. In the village of Upper Moutere, visit the fabulous pottery of Katie Gold and Owen Bartlett, call at a pantry store and design studio and relax over a local craft beer at The Moutere Inn, the oldest pub in NZ. Your ride back to Mapua includes a fabulous long downhill as you ride back down to the coast. Leaving the pretty village of Mapua, you will be following the coast for a short section before heading inland. This is apple country, so look out for the pack-houses and old worker’s cottages on the orchards here. There are three great cafes on this leg, the first at Tasman, the second at Lower Moutere and the last on the outskirts of Motueka. And in between, expect a bit of a climb and some gravel. The Coastal Route by-passes the long main street of Motueka, taking a pretty route past the old wharf and through an area many visitors miss. The town is bustling during the fruit-picking season and you could take a detour to visit the museum in the main street where you will learn all about the tobacco growing heritage of the area. This is a short leg, but you need to allow at least 2 hours cycling time. 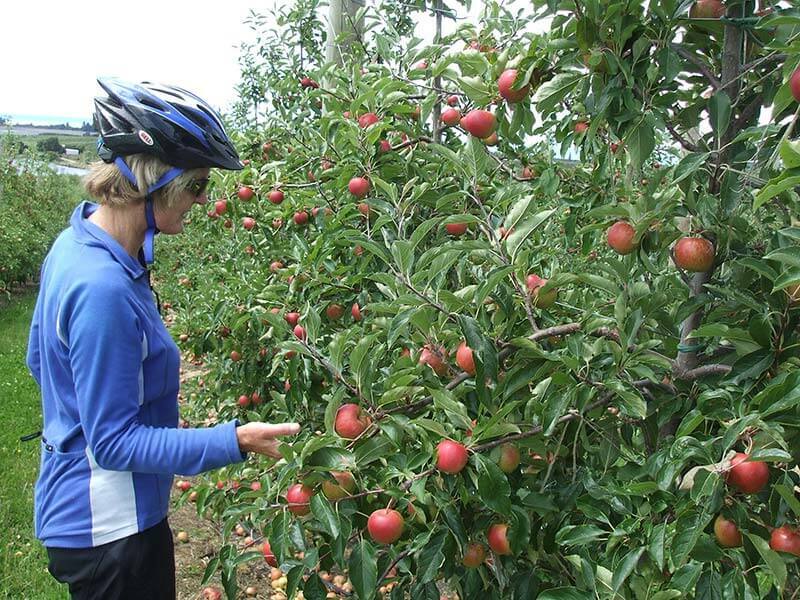 Leaving Motueka, take time to explore the sandspit reserve before the ride to Riwaka, past the most varied selection of trail-side fruit stalls in the area. Take a detour to the craft brewery at Riwaka too. As you rejoin the coast, the trail climbs and drops beside the road for a section before ducking into the Kaiteriteri Mountain Bike Park. This last section of 3.1 km is intermediate grade and takes the Easy Rider Trail through the bike park. The surface here is smooth and it is not technical, but some riders might want to take it very gently or walk some sections as there are some tight corners. The trail winds down through the bush and pine trees and you will soon get your first glimpse of your destination – the stunning golden shores of Kaiteriteri Beach. All our Art and Food packages include door-to-door return transport from Kaiteriteri, bringing you and your bikes back to Nelson. Why not add a day trip in the Abel Tasman National Park to your cycling holiday. This extra night option includes a night at an Eco Resort in Kaiteriteri – the perfect way to relax at the end of your cycling trip. The following morning it is a 10 minute walk down to the beachfront where your Park Day begins. Book your full day Wilsons Abel Tasman trip with us (standard retail prices apply) to receive a complimentary light picnic lunch. Prices start at $82 adult for an Open Day Pass. Please request the “Kaiteriteri Overnight with Park Day” version of this itinerary at time of booking. Includes 5 nights en suite accommodation, twin share.